Dads face an extra hurdle you might not have considered. Changing your kid's diaper in public can be a challenge for any parent. There's the chance that your child's protests over the indignity (how DARE you) will echo beyond the bathroom and through the entire restaurant. Then there are the logistics of juggling a poop-filled diaper, wipes, and a baby dead-set on wriggling itself over the edge of the change table — all in a confined space. Plus there's the very real possibility that you forgot to grab more diapers or a spare change of clothes after a blowout, and you're SOL unless you're game for baby's first nudist brunch. But for dads, changing a diaper in public often comes with an extra hurdle: finding a place to do it. Often, there aren't change tables in men's bathrooms, London, Ont. dad Frank Emanuele told HuffPost Canada in a phone interview. "That would be the biggest challenge," Emanuele said. Emanuele said he believes it's just something that isn't on a lot of business owner's radars. "Which is great. But in our case, we don't have the option of sending a female to change a diaper." 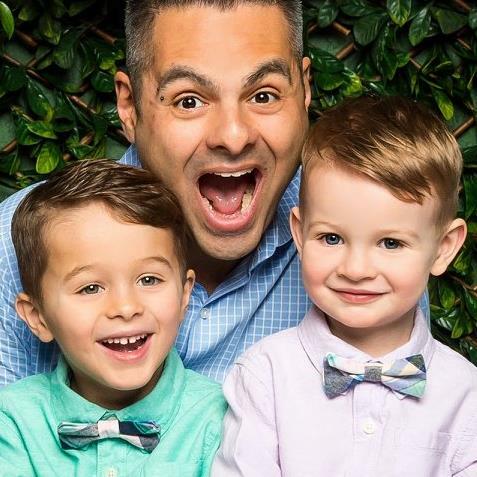 Emanuele and his husband, Norm, have two sons: Luca, 4, and Nico, 2. He's changed a lot of diapers in public, and not always easily, so last year Emanuele was part of a petition to see more family-friendly London, Ont. businesses install change tables in men's bathrooms. The response overall has been positive, Emanuele said. London, Ont. dad Frank Emanuele (centre) with his sons Luca, 4, and Nico, 2. So, what should you do if there's no change table? Whether you're a single dad, a gay dad, or out with your kids alone, you could find yourself in the scenario of needing to change a diaper, with nowhere to actually do it. And, as Emanuele points out, "it needs to be done." If there's no change table, Emanuele recommends you ask to speak to the manager to see what they suggest. Or, ask a staff member to see if the women's bathroom is empty. "I think it's totally fair to ask for help, and it's totally fair to tell restaurants and other businesses that this is something they should consider going forward," Emanuele said. And, failing that, or if no one is around to ask, just find a quiet corner and change your baby there, he added. "It only takes a few minutes. Half the time, no one will even notice. And if somebody does and they have a problem with it, we need to stay calm and be non-confrontational and ask, 'What would you suggest I do?'" Once you're past that first hurdle of finding a physical space, Emanuele's biggest tip for dads is to always keep a spare diaper on hand in case you forget the diaper bag. Emanuele keeps a spare and some wipes in the car, he said. "It's not like we have a purse to carry around and can just throw another one in there," he said. "Put spares wherever you can." And if you're really stuck for diapers, don't be too intimidated to ask other moms or dads with small children for help, Emanuele said. A lot of very-involved dads are afraid to ask for help, and feel that they should be handling everything themselves, he said. Plus there often isn't much community between dads, Emanuele added, which can create a sense of isolation. "People are very happy and very willing to help. I have asked strangers for diapers. It's fine."